On post-race depression, the meaning of life and running with no pants. It’s a chilly October morning in southern Oregon. I’m clinging to a mug of coffee and staring blankly through the window when David Laney runs past. A sense of peace overcomes me. It could be his praying-mantis body, the ’80s neon wrapping his sinew or the immaculate mustache, fit only for legends like himself, Tom Selleck and John Oates. There’s something comforting about his dedication to his craft—you could set your watch to his routine. As a lamplighter toils in the dark of night or a Buddhist monk sits silently on a hill, David Laney puts in the kind of work myths are made of. He kept to the track through high school and college, moving to the mountains of southern Oregon after graduating in 2007. 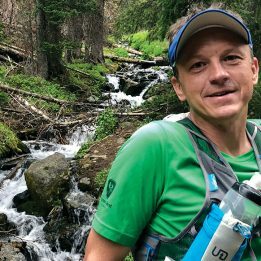 In 2012 he met Erik Skaggs, former Waldo 100K course-record holder, and Hal Koerner, two-time Western States champ, who showed him the ropes of mountain running. He was hooked. Of the 24 races he’s completed since then, he’s stood on the podium for 17. 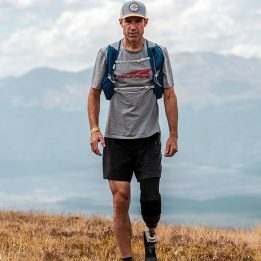 In 2015, he finished UTMB 3rd and joined the ranks of only four other American men to have podium-finished at the race. 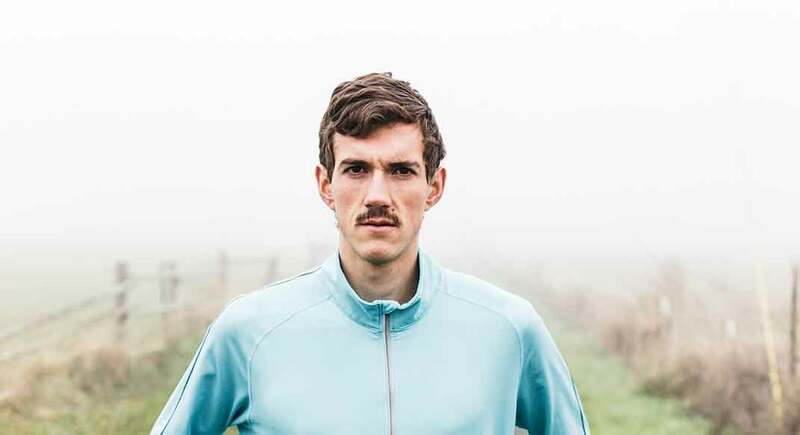 That same year, he was crowned Ultrarunner Of The Year–the youngest ever, at 27. Indeed, when I talked to him one morning in January, he told me he had just lathered his mustache with lavender soap and simply couldn’t stop smelling his upper lip: “It’s like springtime,” he said. What appeals to you about trail running? I like the training for it. I like watching a whole day go by on the trails. How do you feel after finishing a big 100-miler? After UTMB, I moved to Seattle with my friend and didn’t do anything that whole autumn. I started coaching cross country so I’d work like two hours a day. Then I’d go to the park near Lake Union and just sit on a grassy hill for hours. I didn’t want to get out of bed. I tried to run five miles a day even though I didn’t want to. But if I didn’t go then I’d feel even worse. During a race, I know it’s uncomfortable and it doesn’t feel good but I remember there’s always a finish line. But after the race, I don’t have a finish line. I think people don’t realize how bad these races are for your body. They do extensive damage; you are running hard for such a long time. Your brain chemicals get really out of whack after doing something that hard. How do you deal with these episodes? It’s not getting easier, but now I know what to expect. After my first couple hundreds, I thought something was really wrong with me. Generally, I try to sleep as much as possible and just chill as hard as I trained for about a week. Does that make you want to do it less? Not really. It’s a love-hate relationship. 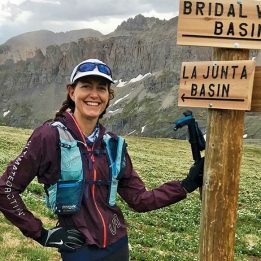 How do you deal with your life outside of training—a life with no “finish line”? A big reason I run is that it provides direction. If I have a race in four months, I live everyday preparing for that race. The training directs my eating, my sleeping, my coaching, my life. It’s really clear and allows me to have a simple answer when people ask me what I’m doing. I just say, “Training for a 100-mile footrace.” Unfortunately it’s a pretty self-centered direction. While I still love [competitive training], I really hope to transition to something different in the next year. I really want to get my hands dirty helping people. But it’s hard to get off the treadmill, so I’m still trying to find another deliberate direction. If you could go back to your 11-year-old self, what advice would you give? In middle school and high school, I didn’t talk to anyone. My grandma would come over on Friday nights. That was great because I got to hang with her, but I didn’t spend time with anyone my age. I probably should have done a better job hanging out with kids, but I was terribly shy. At some point I just figured out that nobody really cares. I still don’t talk to that many people, but I’m more social than I used to be. I was really embarrassed for the first part of the race but by the end I didn’t care. We did that race every year. What advice do you have for burgeoning runners? You have to have patience and realize it’s a process. If you have a bad race, it doesn’t matter that much. Just learn from it, figure out what the problem is and do a better job next time. Once I started being more flexible with my training, I was way less stressed.